Do you have an older model boat that you have been hesitant to use because it seems old? As long as the boat is in working shape, investing in a new paint job on your boat can help bring a whole new look to your boat. A boat is not something that you can go out and buy easily since they can be really expensive. So rather than buying a new boat, it is time for you to pursue a more affordable option. If you live in Minneapolis, MN, let Anchor Marine Repair give your boat a new look by applying a fresh paint job to that boat you have missed using for so long. Our experienced team specializes in boat painting, so bring your boat in before the warmer months arrive! Preparation is the most important part of painting a boat. With so many different nooks and crannies, it is vital that time is spent on the prep work before the actual painting begins. Without spending the necessary time on prep work, the paint job will not look professional, nor will the paint hold up. Sanding and taping are a requirement when it comes to a professional paint job. We know how much your boat means to you. Rest assured that we take special care of every boat that comes into our facility. We share the same passion about boats as you do, so we totally understand. Each member of our staff has been with us for at least 10 years, giving our team a combined 45 years worth of experience in boat painting and repair. Additionally, our team makes it easy on you by offering our pick up and delivery service within a 250 mile radius of our repair shop. 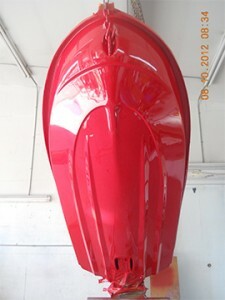 It is time to commit to upgrading the look of the boat that has been sitting in your driveway or yard. Choose the affordable route by investing in a new paint job for your boat. Team up with Anchor Marine Repair, a local company in Minneapolis, MN. Call us today at (763) 972-3540 to set up a free estimate. Would like to get an estimate on a late 70s / 80 Silverline 16′ fiberglass boat. Hull is in decent shape but needs some love. Have a 1963 Scott ski boat. Looking at getting painted. Looking for estimate. Hull seems to be in decent shape.